BOWLS BC » They’re Back! Last year’s National Triples silver team and Provincial Pairs Champions will be headed to Winnipeg. Even though the blistering heat was in full affect at the Nanaimo Lawn Bowling Club, no one likely wanted the men’s final game to end. But after 16-ends of play, the score was 17-16, in what was the closest final of this year’s Provincial Championships thus far. Gord Fall (Skip), Joe Hunt and Glen Taylor, were never more than three shots behind and were leading in ends as well, but in the last end, down 15-17 with last bowl, Fall’s team were only holding one bowl closest to the Jack after all was said and done. Skipper German Santana and Lead Malcolm Taylor will dawn the gold and blue again along with their new addition George Cubiss, a replacement for Mel Eccles due to medical reasons. The guys will be headed to the Norwood & St. James LBCs in Winnipeg come August. On the women’s side, last year’s Pairs winners will be back in the B.C. uniform after winning the Women’s Triples Championship at the Courtenay LBC. Skip Mary Wright and Belle Chan are playing with Ann Van Bastelaere. Their team was victorious over Mary Mulligan, Chris Fereday, Lynn Chwartacki who pick up Silver and a repeat Bronze for Ann Mathie alongside Jill Foster and Sue Watt. Tomorrow and until Sunday July 20, the Junior and Under-26-year-olds will start their quest for a Provincial medal at the Kelowna LBC. 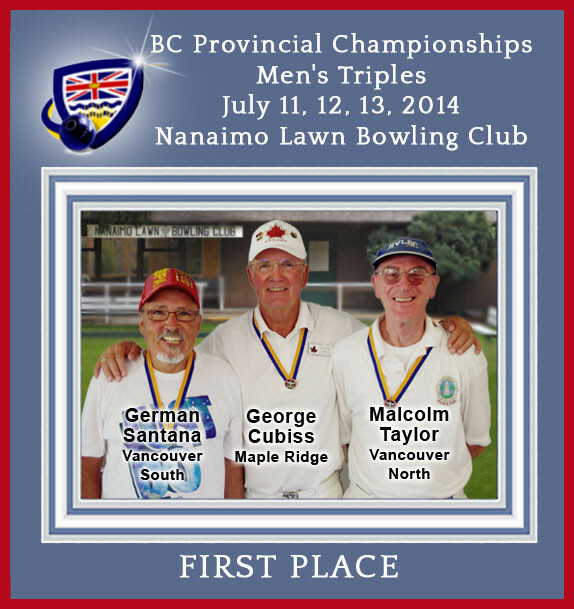 The next Major Provincial will be the Pairs, July 25-28 at the New Westminster LBC.